Every year, millions of patients visit their dermatologist’s office complaining of fine wrinkles and extra skin. Traditional treatments have included non-ablative lasers, laser resurfacing, topical retinoids (Retin-A) or the more invasive face-lift. Recently, a new non-ablative therapy has been developed called radiofrequency resurfacing - Thermage. Thermage works by delivering heat energy through a handpiece to the deeper parts of the skin (dermis). This handpiece also has a cooling spray that protects the superficial part of the skin (epidermis) from injury. The heat energy causes the deeper tissues to contract to decrease the appearance of lines. Eventually new collagen develops and remodels to give an even firmer appearance to the skin. This technique is non-ablative in that it does not cause damage to the surface of the skin. As discussed above, Thermage does not cause damage to the skin surface, unlike dermabrasion and laser resurfacing. Therefore, there is very little down time. Treatments can take up to two hours, depending upon the size of the treatment area. Patients can return to work the same day, unlike a facelift in which patients usually take at least 2 weeks to recover. 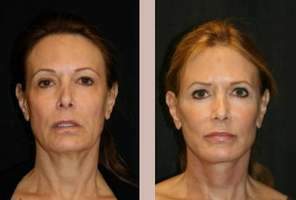 Similarly, there is no scar unlike the surgical facelift procedure. Effects of the Thermage procedure can last from 6 months up to 2 years. Thermage is painful and requires an anesthetic cream and occasionally nerve blocks or IV sedation. Side effects can include redness, swelling, bumps and blisters. These should resolve over a few weeks. How long does the Thermage treatment take? What will my skin feel like after the Thermage treatment? Thermage can cost from $900 - $4000, depending on area and degree of work. The old (original) protocol of one or possibly two treatments was very painful. Newer protocols entail more treatments over time with less discomfort. These newer protocols produce more desired effects and require less power per treatment. Photos Courtesy of Julio Barba, M.D.,Kim Schuchardt, P.A. (Richard Neils, M.D. ), Mark Nestor, M.D. and Robert Weiss, M.D.